On these wheels, the drive-band runs over the bobbin-whorl. So, when you are treadling, the bobbin turns and the flyer is stationary. When there is yarn on the bobbin and you hold its end in your hand, the yarn ties the flyer to the bobbin and the flyer has to follow the bobbin around. Generally there is a brake on the flyer (often a leather band whose tension can be adjusted by means of a bolt). Tightening this brake-band slows down the flyer and increases take-up. There are wheels, however, where you don't need to tighten the brake-band for spinning (or where you can even remove it completely if the wheels permits). The flyer's drag offers enough resistance. This means that all double-drive and many scotch-brake wheels can be converted to bobbin-lead - just run the two drive-band loops over the bobbin-whorl and see whether you like to spin this way. 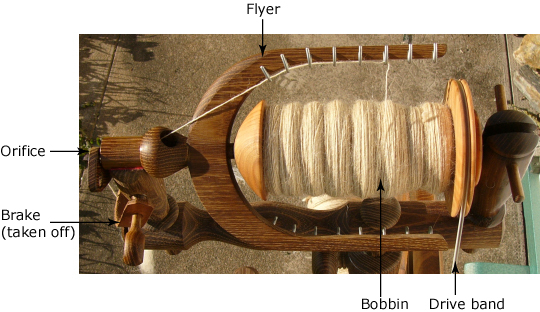 Contrary to popular opinion, even on a bobbin-lead wheel take-up decreases as the bobbin fills. You will notice it when plying, when you will probably want to adjust brake tension as the bobbin fills. For spinning, however, the reduction in take-up may not be an issue because only with a half-full bobbin is it finally low enough for comfortable spinning! Which means that you can put some padding (like foam tubes for insulating water pipes) around the bobbin-core to reduce take-up for spinning fine yarns. The big advantage of the bobbin-lead system is its simplicity, both in construction and use. It is the easiest wheel to build. This means that the risk when buying a used wheel is rather small - there's a good chance to get it working. In use, the bobbin-lead wheel is simplicity itself, especially if it's one of the wheels on which you can spin without brake: You just spin, and spin, and spin. No need to adjust the brake and the bobbin is changed in seconds. Take-up happens when the flyer stalls and the bobbin continues to turn. This means that during take-up there is no twist added to the yarn, which can be a desirable quality for spinning soft yarn. Often bobbin-lead wheels have bigger bobbins than other systems (the Louet S10 and its relatives come to mind, the Henkys, and the Ashford Countryspinner is also a bobbin-lead wheel). The main disadvantage is that often the take-up of these wheels is so big that you feel like engaging in a tug-o-war with your wheel. Spinning fine thread or difficult (slippery, short) fibre can be next to impossible. Because of the strong take-up I would not recommend bobbin-lead wheels as beginner's wheels, despite their simple construction. When you let the flyer come to a (near) standstill for take-up, it will noticeably jerk on your yarn when you want to continue spinning. Bobbin-lead wheels are fabulous for plying. The difficulties they present for spinning are not important for plying and the strong take-up and big bobbins are definite advantages. Thick woolen yarns (think winter sweaters) are another area where bobbin-lead wheels excel. My experiences are limited to the Henkys "Das Bewährte" and Ashford's Countryspinner. I would buy neither of them as my only wheel. The Countryspinner is a specialist wheel for extremely thick yarn (rug wool, novelty yarn) and the Henkys is a "tug-o-war wheel". However, if you have a wheel which sometimes doesn't offer enough take-up for your purpose (like the Kromski Mazurka for me), or whose small bobbins make you despair, then look to bobbin-lead wheels if you are thinking about a second wheel.